Subject: Do most Americans know about this? This escalating abuse is horrific. 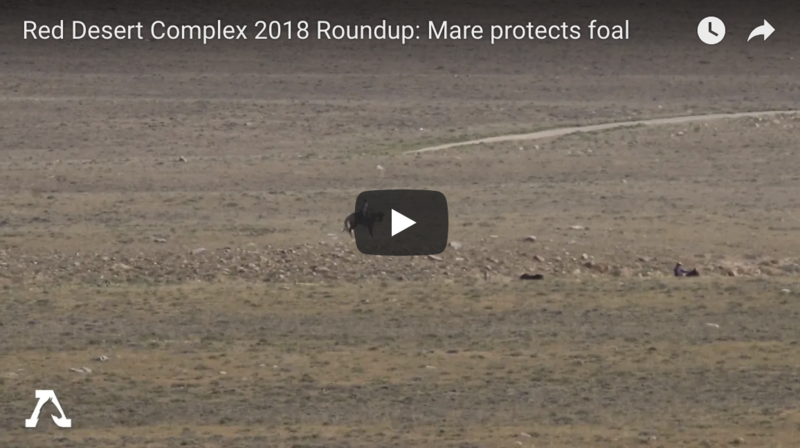 The latest video captured by our observation team in Wyoming shows a mare trying to protect her foal while being rounded up by a helicopter and men on horseback with ropes. Later in the day, our observer photographed the exhausted foal lying lifelessly on the ground in a holding pen. By the next morning, he was dead. Please share sign and this petition. Most Americans have no clue what’s happening on public lands at the hands of our government. The abuse of wild horses is taking a huge toll. Roundups are hardest on young foals, who are pushed too far and too fast in the summer heat. Half of the wild horse deaths so far in the Wyoming roundup have been foals. At least three were literally run to death. Here’s the math: if everyone of us shares this petition with 5 friends, more than 1 million people will learn about this abuse. And if just 1 of those 5 signs our petition, we’ll double the size of our movement overnight. We need our political leaders to hear from outraged Americans that this abuse must stop. Sign and share this petition now. They have the money and power. We have the people. Let’s get this done! Kill the wrong spider, go to jail!